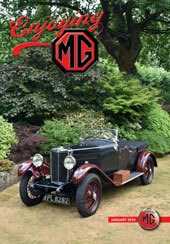 Past winner of `Best Club Magazine of the Year', our full colour monthly magazine is packed full of matters MG. Informative articles ranging from technical features, tips, advice, new product information to articles on particular models and sporting coverage can be found amongst its pages. An extensive Mart section brings you literally hundreds of MGs for sale as well as members and Trade advertisements selling spares and secondhand parts. The Club's nationwide busy social scene is found amongst Regional Roundup, detailing all the monthly happenings and events in which everyone can participate. Login Here to view an Electronic Version of Enjoying MG. Choose 'Electronic Magazine' from the 'Members Area' drop down menu. The current issue of Enjoying MG will be published on the 1st day of each month and will be available for viewing for the full month until the following issue replaces it. This exclusive benefit will enable members around the world to view the magazine on the day of publication and will be in addition to the printed version which will still arrive through your letterbox at the beginning of every month. Practical and Technical Tips is the Club's very popular booklet containing some useful tips and hints of a technical nature for when you are working on your MG. 150 pages of information on many of the MG models. Compiled from previously published and new technical tips, articles with clear diagrams and step by step pictures. `Practical and Technical Tips' is available from the Club at a special price of £4.50 if ordered when joining or normally £4.95 (including post & packing).